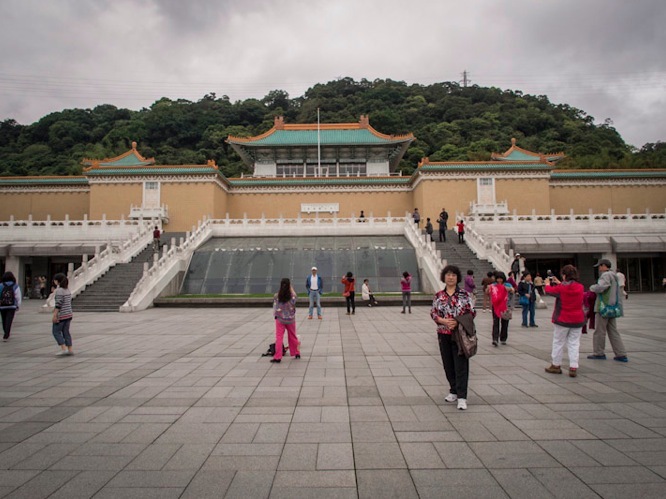 Of course, we also visited the famous National Palace Museum in Taipei – which is probably one of the top two sightseeing destinations (together with Taipei 101) in the city. Everyone goes there to see the largest collection of priceless Chinese artefacts and artwork in the world, including ancient bronze castings, calligraphy, scroll paintings, porcelain, jade and rare books, many of which were possessions of the former imperial family. So of course, we were overran by bus loads of visitors, many from mainland China. We had made the biggest mistake ever and went on a Sunday, so there were thousands of visitors and as a result we had to follow a visitor route through the museum. 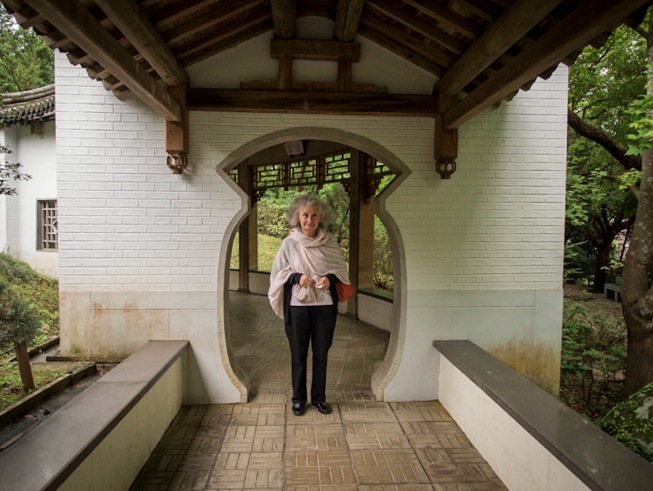 This was more then painful – we were there to see a mix of artefacts, not just the jade cabbage, which was part of the dowry of Concubine Jin in the Qing Dynasty (1644-1911). But apparently everyone else was there to see the carvings made from a single piece of jade that is half grey and half emerald green. We tried to jump the queue so that we did not have to wait for an hour to see the jade cabbage and it resulted in me being chased by one of the most ferocious museum wardens I’ve ever encountered. She was just about to pull my hair and push me away – I literally had to tell her to not touch me. I just wanted to pass the queue and go to the left, to the next exhibition hall (and not to the right, where everyone was queuing up for) but she was adamant that I had to queue with thousands of others and then go to the right. While the not-very-helpful guide was radioing her colleagues for help, I just turned around and walked into a calligraphy exhibition at the other end of the hall – I had enough of her and just wanted to enjoy some exhibits without being squashed. We spent the next two hours exploring the different exhibitions – the museum holds just under 700,000 pieces stretching from 6,000 BC. to the post-war period, and about 1,700 pieces are on display at any one time. That’s still enough to fill three floors with exhibits – and the jade, pottery and bronze holdings are breathtaking. Some really amazing ceramic works, it’s quite unbelievable how ancient some of the artefacts were – the colours looked so fresh and some of the designs could have been created in the last 100 years. Unfortunately you can’t take pictures inside the museum – just upstairs in the tea room (which is very nice, but expensive). So I can’t show you any images from the inside. You’ll have to go yourself! However, I can share a few pictures we took in the Zhishan Garden, which is to the right of the main building. 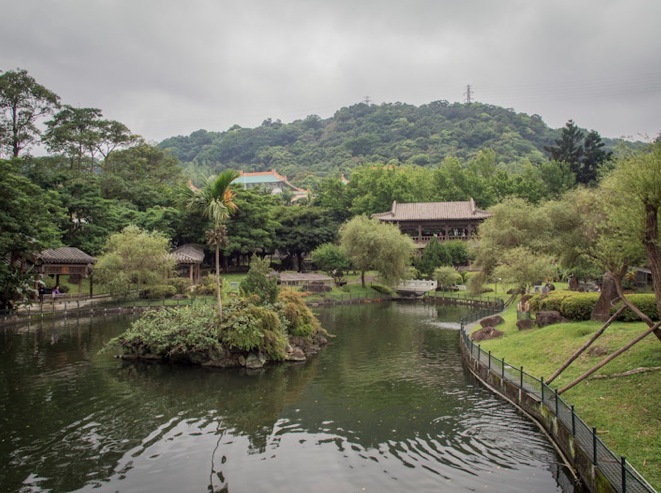 It is a quiet, small garden – the pond has a few big koi fish that kids were feeding, but apart from that there were just a few people sitting on the benches, reading or chatting with each other. 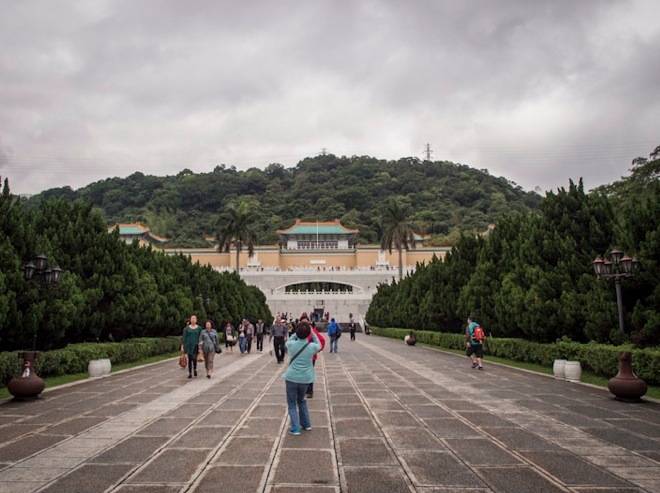 It was the quietest corner of the whole National Palace Museum. That’s really a huge museum! We went there when we visited Taipei last year, it really is a lovely museum full of interesting artefacts. We went on a weekday I think and it was busy but we weren’t forced into a queue. The image of you running away from the guard is really funny!